Check out our Pompey away travel guide for the visit to Peterborough, courtesy of Pam Wilkins and Johnny Moore in memory of Ken Malley. Pompey will visit high-flying Peterborough on Saturday, September 15 (3pm). THE GROUND: Blues fans are headed for the Posh’s London Road stadium, which is also known as the ABAX Stadium for sponsorship purposes. The ground is, unsurprisingly, situated on London Road, PE2 8AL. Peterborough’s home has a capacity of 15,314 and Pompey supporters will be in half of the Motorpoint (East) Stand. Kenny Jackett’s Blues suffered a 2-1 defeat at London Road last season. Prior to that, Pompey clinched a 3-0 Championship success in 2012 with Erik Huseklepp netting twice. London Road is on the outskirts of Peterborough city centre and is fairly well signposted. Leave the A1 at junction 17 and take the A1139 towards Peterborough. Then take the third exit slip road onto the A1260 (signposted city centre). Leave the A1260 at the first exit – signposted Orton Malborne – and at the roundabout take the third exit into Morley Way. Then at the next roundabout take the first exit into Shrewsbury Avenue. After half a mile you will reach a set of traffic lights, with a car sales showroom on one corner. Turn right here on to the A605 Oundle Road. Continue along Oundle Road and you will see the stadium on your right. 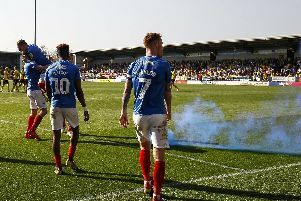 Please note, there will be no tickets on sale to Pompey supporters on the day of the League One encounter with Peterborough. PARKING: There is no parking available at the ABAX Stadium for visiting supporters. However, there is a council pay-and-display car park just off London Road. From the city centre, turn right at the traffic lights after crossing the bridge over the River Nene. You will find the car park immediately on the right. All the council pay-and-display car parks are open 24 hours. Otherwise, there is parking to be found on side streets further up Oundle Road. Please check for any parking restriction signs on lamp posts. The side streets nearest the ground operate a residents-only parking scheme. Up-to-date match day information is available via @PompeyfcCop on Twitter. FROM THE STATION: Trains run direct to Peterborough from London Kings Cross and the journey will take about 50 minutes. But getting to London from Portsmouth by train could be a problem, so allow plenty of time. On the South Western Railway network from to London Waterloo, the RMT trade union is planning industrial action on the day of the game. Services are likely to be limited. On the Southern Railway route to London Victoria, engineering works mean there will be replacement buses between Three Bridges and Horsham. Peterborough Station is about a mile from the ABAX. If you fancy the 20-minute walk, turn right out of the station and follow the main road, passing an ASDA store. At the traffic lights turn right. Go over the bridge and you will see the floodlights on your left. EATING & DRINKING: Peterborough city centre is only about 10-minutes’ walk from the ground. There is a burger bar outside the ground, a KFC opposite the stadium and various food outlets along London Road. Near the station is the Brewery Tap, 72 Westgate, Peterborough, PE1 2AA. It is the home of the award winning micro-brewery Oakham Ales and also serves Thai food. The Palmerston Arms, 82 Oundle Road, Peterborough, PE2 9PA, is an away fan-friendly pub serving real ale direct from the cask. It is about 15-minutes’ walk from the ground and on match days sells rolls, pies and pasties. Nearby, also in Oundle Road, is the Woolston fish-and-chip shop. As you come over the River Nene, proceed down London Road past the ground on your left and at the next traffic lights you will find the The Peacock, 26 London Road, Peterborough PE2 8AR. It is a family-friendly pub, welcoming away supporters and serving pub grub on match days. If you want something a bit different, try Charters Bar, Town Bridge, PE1 1FP. The venue is a former Dutch cargo barge moored on the River Nene, a few minutes walk away from London Road. It is on the left-hand side of the bridge, going towards the city centre. Upstairs is a Chinese restaurant but downstairs is a bar with a large selection of real ales. Inside the ground there are the usual burgers, hot dogs, pies and pasties but alcohol is not usually available to away supporters inside the ground.